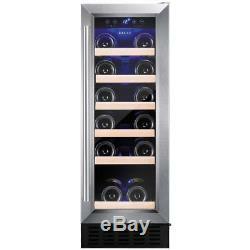 The AWC300SS is a freestanding, under counter, 30cm wine cooler with great capability within a stylish exterior. 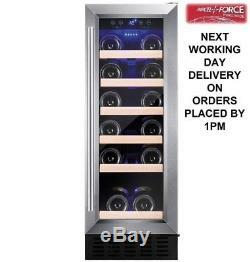 Features include, wooden slide out shelves with the capacity to hold 19 bottles, electronic temperature control with an over temperature alarm, and UV protected smoked toughen to keep wine in the perfect conditions. This product comes with a 2 year parts and labour guarantee. Energy consumption per annum: 130 kW. Rated power supply: 220-240/50 Vac/Hz. Power supply required: 13 A. 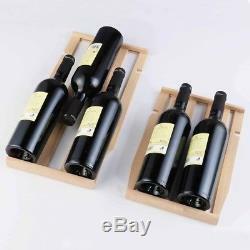 Power cable length: 1.8 m. Net cabinet volume: 58 L.
Total bottle storage: 19 (75cL Bordeaux bottles). The item "Amica AWC300SS 30cm 19 Bottle Free Standing Wine Cooler In Stainless Steel NEW" is in sale since Sunday, April 22, 2018. 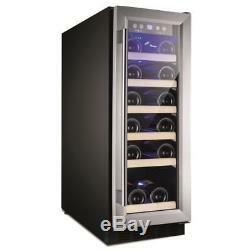 This item is in the category "Home, Furniture & DIY\Appliances\Fridges & Freezers\Wine Cabinets/Fridges".